As a Regional Affiliate for the Scholastic Art & Writing Awards, in the months of January and February the education department at FWMoA undertakes a myriad of projects outlined in their job description as, “Performs additional tasks and accepts other responsibilities as requested” or, in simpler terms, “Other duties as assigned”. One of the largest of these “additional tasks” is the Scholastic Art & Writing Awards exhibition. Students are led on a tour of the 2018 Scholastic Art & Writing Awards Exhibition. The exhibition includes hundreds of paintings, drawings, ceramic pieces, jewelry, and writing excerpts. Photo by Alyssa Dumire. Wait, isn’t the job of a museum to exhibit works for the public to view? Yes, it is! Exhibitions, however, are ordinarily the domain of our curatorial department. When curators put together an exhibition, whether in collaboration with a working artist or with works in the museum’s Permanent Collection, they follow a fairly standard procedure. The gallery space is chosen, contracts are drawn up, and works are selected and shipped. With a Permanent Collection display, the curator spends time looking through the collection and choosing works that fit together either by artist, material, art movement, or even when we collected the pieces! The curator then spends a few days perfecting their “layout”, or where they want the works to be displayed in the gallery. The Scholastic Art & Writing exhibition, however, has a completely different process. Artworks laid out by size. Laura, a FWMoA intern, begins hanging Gold Key Artworks. Award recipients and their educators were contacted shortly after judging in January, via email, and asked to bring their awarded artworks to the museum. In past years, artwork was divided and hung by Award: Gold Key, Silver Key, or Honorable Mention. This year, due to the number of pieces we receive and the spatial limitations of the galleries, all Gold Key works plus one work of the award recipients choosing, in either Silver Key or Honorable Mention, were dropped off for display. This departure from previous years is also a movement towards curation, instead of hanging artwork as it fits it is checked off and organized by category (painting, ceramics & glass, fashion). Unlike a normal exhibition, this one includes about 700 works of art. Paintings, drawings, and photographs get hung on the wall. Mobiles get hung from the ceiling. Ceramic works get placed on pedestals spread throughout the three galleries. Fashion pieces, displayed on mannequins, are also included. So how do we showcase 700 artworks in 17 different categories, from Photography to Film & Animation, in the way that best highlights them? This unique exhibit, both in number of artworks and in medium of works, results in an inability to “layout”, or preview, how the works will look on the wall and in the gallery. With a week to install, there is no way to layout 700 artworks to see how they fit together. Instead, once categorized, artworks are separated by size and then hung on the wall with big pieces going first and smaller pieces filling in the gaps. Hanging artworks to fill in the gaps. Preparing ceramic works to be placed on pedestals throughout the galleries. Film & Animation are looped and shown on a TV in the gallery. Art Portfolio’s, which are submitted by senior students and represent their 8 best works, are shown on an iPad so that each work can be included in the show. Students also submit works of writing to this competition, and finding a way to properly showcase writing works in a museum setting has provided us with another unique challenge. Artists want their work to be hung on a wall, or displayed on a pedestal. But writers? Writers want to be published! Therefore, though we do hang writing works on the wall, we also provide publications of the recognized works. A finished wall of writing works. Writing works are exhibited by category as well, with Gold Key works hung above Silver Key (see photo above). Printed on standard size paper, with Gold Key slightly larger than Silver Key, the 200 or so writing works are laid out and measured before being hung on the wall. Different from artworks, writing works don’t look “good” or “bad” next to each other. They are not all different shapes and sizes. To meet the challenge of displaying writing works, an iPad that includes the full stories submitted in Senior Writing Portfolio’s is included. A directional speaker is hung and connected to another iPad so visitors can hear the recorded works of our American Voices nominees. Finally, both published books (new this year!) and eBooks are created of the writing works so that they can be read in full by visitors. (The paperback books can be purchased online at Lulu.com, keyword search Scholastic 2019!). 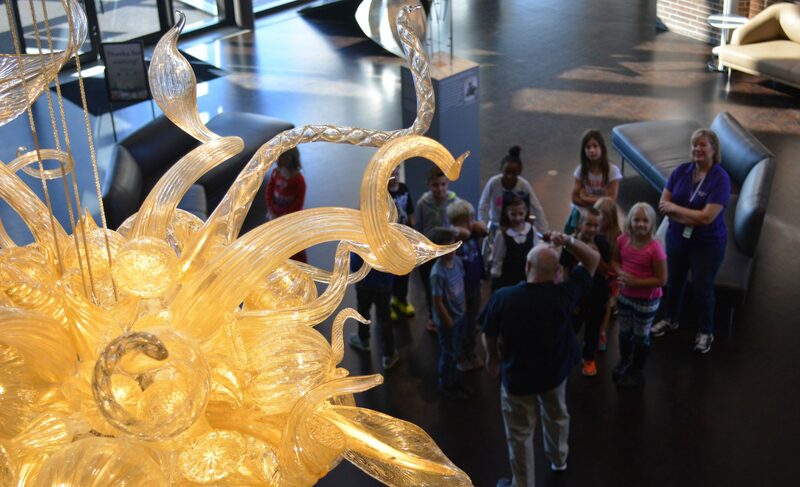 This exhibition, which the Fort Wayne Museum of Art handles every year, includes the work of the education, curatorial, technical, and marketing teams plus educators, students, and a handful of interns and volunteers! Though every exhibition includes it’s own challenges, the sheer number of works, multitude of mediums, and inclusion of writing in a museum show makes the 2019 Scholastic Art and Writing Awards exhibition a work of creative collaboration. Now that you’ve gained behind-the-scenes access to one of our largest exhibitions every year, come see the next generation of great American artists and writers for yourself! The 2019 Scholastic Art & Writing Awards Exhibition opens on Saturday, February 9th and runs through Saturday, April 6th, 2019!